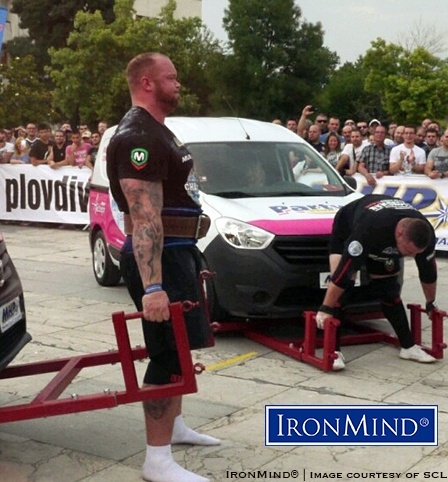 Polish strongman competitor Krzysztof Radzikowski won the 2015 MHP SCL World Championships. With the holidays just around the corner, ten athletes left their homes with snow and cold, winter winds to converge upon Antalya/Kemer, Turkey where warmer temperatures and ocean side views awaited them. 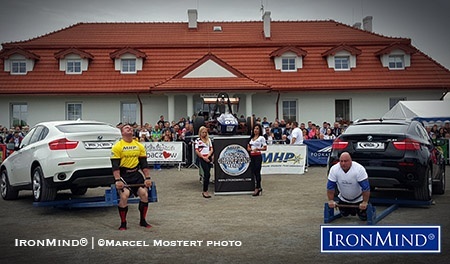 The time had come for the final stage of the MHP Strongman Champions League and the crowning of the world champion to close out the 2015 season.After 15 brutal competitions world-wide, Radzikowski had a comfortable lead of 29 points. He had his sights set on his second SCL Championship. Danis Zagaris, however, planned to make him fight for it. With the final worth double points, anything could happen. The competition started on Saturday with two events, the front hold and 95kg dumbbell for reps. With a competition debuting for the first time in Turkey, the crowd was motivated and excited to see these giants at work. Bjorn Solvang took an impressive first place with 51.17 seconds. Alex Moonen took second with 48.53 sec and Krzysztof Radzikowski had 47.64 seconds. The second event was the 95kg dumbbell for reps. True to form, Matjaz Belsak came in first with an impressive 10 reps. Radzikowski took second with nine reps and JF Caron and Marius Lalas tied for third with 8 reps.There were a few surprises after day one with Radzikowski holding a slight lead over Alex Moonen. Moonen was performing well while Danis Zagaris and JF Caron were down in the pack holding the 6th and 7th place positions. Day two began with sunny skies, warm temperatures and a truck pull on the agenda. Some may recall last year’s dramatic bus pull in Malaysia where the 2014 World Champion, Martin Wildauer, snapped his Achilles, but still went on to win the overall championship. Fortunately, this year was smooth sailing. Krzysztof took first with a fast 25.26 sec with Matjaz Belsak finishing a little over a second later with 26.62 sec. and JF Caron making some waves with 27.23 sec. The fourth event was the shot put with a 14.5kg ball. This was a completely new event for most athletes. Many had no idea how well they would perform with this discipline. The SCL had this event two years ago in SCL Portugal where Vytautas Lalas was the winner.The weight is double the size of a normal shot put which is 7.26 kg. But Krzysztof won this event in a new world record with 8.62 meters, just ahead of Dainis with JF Caron placing third. Well done by Krzysztof who set another world record this year. Despite a chest injury on the bus pull, Stojan Tordochev continued to fight performing the shot put with his left hand. The final event that would determine the new world champion was a loading race on the beach with two 120kg sacks and a 130kg natural stone. Due to Stojan’s injury, he could not complete the loading race, leaving Adin Arnaut to complete the tough course on his own. After he completed it was head to head battles. The excitement was building and it was an all out battle. Danis edged out Alex Moonen in their heat leaving Matjaz Belsak and Krzysztof Radzikowski in the last heat. It was a tough matchup with both athletes struggling with the stone. Surprisingly Belsak had to face the consequences of some errors costing him a podium place. The final results of this event left JF Caron in first with 21.76 seconds, Danis Zagaris in second with 24.87 and Marius Lalas in third with 30.08 seconds. As the sun began to set behind the mountains, we had a world champion before us. Krzysztof Radzikowski won both the 15th stage in Antalya and became the 2015 World Champion. Dainis Zagaris had the only chance to catch Radzikowski and become world champion. When asked if he was disappointed with the result, he shrugged and said, “I’m happy because I was disappointed after the first day.” And with a huge laugh he pointed at Krzysztof and continued, “and this a**hole is strong.” With a huge laugh between them, this was the perfect example of camaraderie of competition in the strongman sport. Krzysztof was thrilled to be the World Champion for the second time. His last win was in 2013 and he placed 2nd last year after battling injuries. Even in this year’s finals he competed injured. After tearing his bicep in SCL Romania, he continued to compete and has surgery scheduled later this week. “I will have surgery on my bicep this Thursday,” he stated. He described how his doctors are using a new technique to provide fast recovery and he expects to be back to normal training again in three to four weeks. Radzikowski has no plans to slow down with SCL Norway in January and World’s Strongest Man on the horizon. He also has some plans to compete in powerlifting competitions this year. Of course, he plans to retain his SCL title for 2016 too. Krzysztof Radzikowski led after day of the 2015 MHP SCL finals, with he eye fixed on becoming the 2015 Strongman Champions League World Champion. Day one is complete here in Antalya, Turkey and the competition is heating up. Krzyzsztof Radzikowski has his eyes set on becoming the World Champion, but Dainis Zagaris doesn’t plan to let that happen. After a day of sightseeing at the Antalya Aquarium, home of the biggest tunnel aquarium, it was time to get to work. Yesterday, two events were completed with three events scheduled for today. The first event was the front hold which took place on stage in an open air amphitheater. Bjorn Solvang took an impressive first place with 51.17 seconds. Alex Moonen took second 48.53 sec and Krzysztof Radzikowski 47.64 seconds. The second event was the 95kg dumbbell for reps. True to form, Matjaz Belsak came in first with an impressive 10 reps. Radzikowski took second with nine reps and JF Caron and Marius Lalas tied for third with 8 reps.Tomorrow will be the ultimate crowning of the MHP Strongman Champions League World Champion. With the truckpull, shot put and loading on the beach front, it’s set to be another amazing day with a battle to the very end. Watch IronMind for the final results. Zach McCarley and Ben Kelsey prevailed at SCL’s World’s Strongest Man under 90 kg/105 kg, respectively, and Kikki Berli has reported on the contest for IronMind. Last weekend SCL World’s Strongest Man u90 and u105 kg was arranged in Spydeberg, Norway. 52 athletes from 25 nations were qualified for the big competition that Tim Enersen, Norway’s Strongest Man u90 kg, was in charge of. The qualifier for the finals was held Saturday, with three events on the schedule. The events were Apollon’s Axle for reps (120/130 kg, 60 sec), farmers walk (120/130 kg, 2×20 m) and tyre flip (360/400 kg, 6 flips) The twelve strongest men in each class were qualified for the finals the next day. At noon the next day 24 very excited men were gathered in Spydeberghallen. The TV crew was getting their cameras and mics ready, the competition crew was getting the arena ready and audience started to fill the tribunes. You could feel the testosterone in the air as the athletes were warming up backstage and the air was vibrating with excitement. First event was Apollons Axle, last man standing. The start weight for the u90 kg class was 130 kg, and then the weight was increased by ten kg for each round. The current world record in the u90 kg class was 160, and Zach McCarley from USA was determined to set a new record during the comp. He did 165 kg easily, sat the axle down, bowed to the audience and decided to go for 180 kg. Zach did a very good try, but missed the lift by an inch (2.5 cm). The two Norwegians, Tim Enersen and Loyd Kaaland, both had a try on the 165 kg lift, but missed, and ended up on 155 kg. For the u105 kg athletes the start weight was 140 kg, with 10 kg increases here as well. The current world record in this class was 173 kg, and several of the athletes were eager to set a new record. Vladimir Reksha from Ukraine did the first record attempt. He did the 175 kg clean and press very elegantly, followed by Joergen Aukland from Norway, Antanas Ziurauskas from Lituania, Ben Kelsey from the UK and Marcin Sendwicki from Poland. The next attempt was 180 kg, a lift that Reksha, Kelsey and Sendwicki did. Both Sendwicki and Reksha had a try on 185 kg, but didn’t get a good lift. The world record is Reksha’s. The second event was a medley, consisting of duckwalk (170 kg, 10 m), suitcase loading (100 kg, 7 meter run, loading on to table 115 cm height) and farmer’s walk (2×120 kg, 10 m) Both classes had the same weights in this event. All athletes completed this medley, with Reksha was the fastest in both classes with his 16.69 seconds. After this event Paavo Paaso from Finland pulled out of the competition because of an injury in his shoulder. Third event was arm over arm, 18 meter, ca. 6000 kg for the u90 kg athletes and 6500 kg for the u105. All the athletes had great technique for pulling, and fastest of them all was Zach McCarley with 14.16 sec in the u90 and Vladimir Reksha with 14.73 sec in the u105. Fourth event was supposed to be Atlas stones, but because of the tacky it was decided to switch the fourth and fifth event, so car deadlift came fourth. The weight in hand for the u90 kg athletes was 280 kg, and for the u105 it was 310 kg. For the lightest class the weight was set too high, and only 6 of 12 athletes got counting results. Tim Enersen won the event with 3 reps, while Reymond Rabben from Norway was fighting his single rep up extremely slowly. In the u105 class Ben Kelsey and Marcin Sedwicki were by far the strongest deadlifters. Ben ended up with 11 reps, while Marcin had 10. Maybe it was the front hold in the car deadlift that made this event so difficult for so many of the athletes? I don’t know … I just know it was surprisingly few reps to be counted. Last event was the signature event of this wonderful sport: the atlas stone series. The stones were to be lifted on to platforms of different heights, with the highest platform being 170 cm. When you know that most of the athletes weren’t very tall, you can imagine the struggles the guys had to go through to get through this event. For the u90 the stones were 100-120-130-140-160 kg, where the lightest stone should be loaded to the highest platform. Reymond, who just a week earlier had loaded a heavier stone onto a 170 cm high platform, didn’t managed any of the stones, and was left with no reps. Zach won the event with all five stones in an amazing 27.31 seconds. For the heavier guys the series was 120-130-140-160-190 kg, loaded onto the same platform as the lighter guys. All the athletes managed at least three stones, and the winner of the event was Jiri Gronman from Finland. Because of the switching of the events, the secretary had to go through the scoresheet to set numbers straight, so the athletes had to wait a few minutes for the results. When the results were ready, it showed that Zach McCarley from USA had won his class and for the next year can call himself World’s Strongest Man U90 kg, and Ben Kelsey from England for the next year can call himself World’s Strongest Man U105 kg. On behalf of SCL and the crew working during this weekend, I would like to thank both athletes and audience for an awesome weekend. 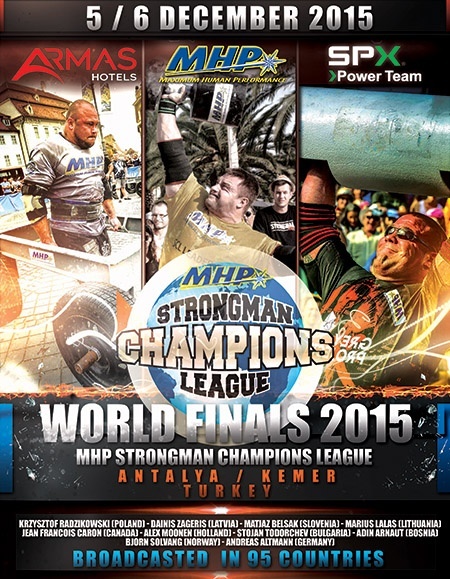 “The strongest men on the planet will come to Turkey on 5 and 6 December, to fight for the ultimate title, SCL World Champion 2015,” Strongman Champions League Director Marcel Mostert told IronMind today.After 15 stages done world wide in the MHP Strongman Champions League, with the last one done in Martinique in October, the finals will gone happen in Antalya en Kemer, Turkey. It is a pretty big operation to set up the finals in just 2 weeks’ time, but with the help of other good organizations and solid business relationships, SCL did this job remarkably well. “So, the new world champion 2015 will be crowned at some great venues in Antalya and Kemer, with a total 10 finalists by the SCL ranking competing. 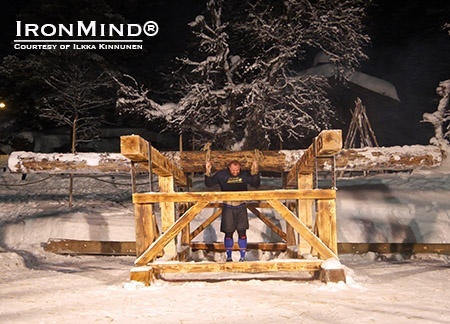 Latvian strongman Dainis Zageris took top honors at SCL Martinique and SCL cofounder Ilkka Kinnunen reported on the action for IronMind. Last weekend The SCL gathered to Martinique and its capital Fort-de-France for two days of competition. 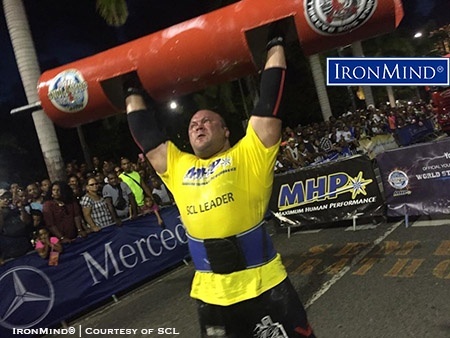 This was a third time in past three years that the organizer Pierre Emmanuel Jos hosted an SCL series event, and once again, he did it with great success: Around 15,000 people cheered and watched the SCL strongman giants compete in a total of 7 disciplines. Both days the weather was nice, around +30 Celsius (about 86 F), sunny with a light wind. The first day or competition started with the Truck Pull, using a Harness and Rope. It was a 10-ton truck and the course was 25 meters and slightly uphill. Canadian J.F. Caron had the best time, 28.70 sec. Latvian Dainis Zageris was second and Bulgarian Stoyan Tordochev was third. Next was the Log Lift for reps, using a 140-kg log. Dainis Zageris and Slovenian Matjaz Belsak tied for first place, with 9 repetitions, and third was J.F. Caron, with 7 reps. The last event of the day was Car Deadlift (350 kg) for reps and J.F. Caron did amazing 15 repetitions to easily win the event. Second was Dainis Zageris (10 reps) and third was Matjaz Belsak (9 reps). The second day started with Forward Hold, using 30 kg total weight. The winner was Holland’s Alex Moonen (52.02 sec). Dainis Zageris was second (51.52 sec) and third was J.F. Caron (49.75 sec). Next was the Hercules Hold with Cars. Stoyan Tordochev won (27.40 sec), second was Dainis Zageris (23.84 sec) and third was Swedish strongman Johan Espenkrona (21.77 sec). The sixth event was an arm-over-arm Truck Pull: 10 ton and 25 m. Matjaz Belsak won (43.76 sec), Dainis Zageris was second (46.66 sec) and the UK’s Daniel Garcia was third (48.91 sec). The last event of the competition was Tyre Loading, and the winner was Matjaz Belsak (15.06 sec), followed by Dainis Zageris (18.66 sec) and Johan Espenkrona (19.59 sec). They tied on final points as well as first place finishes, but Dainis Zageris had more second place finishes than did Krzysztof Radzikowski so Zageris picked up the win at SCL Romania, the second of his career. In a two day hard battle in Romania, Dainis Zageris turned out to be the strongest last weekend in the MHP Strongman Champions League 2015. It was really a hard fight over 7 events with 12 athletes at the start. The top four were very close, and changed after each event, which was very exciting. Dainis Zageris ended with same points as Krzysztof Radzikowski, 60 in total, and both had won one event, but Dainis had more second places, so he won in Romania on countback. Alex Moonen finished in third place, at 59.5 points, just a half point missing from the leaders, but one point ahead of Stojan Todorchev from Bulgaria. Lauri Nami ripped off the tendon of his Achilles completely in the wheel flip. But he won the wheel flip as well in the fastest time—only his last flip went awry. How bizarre. Also Stojan had a little tear in his chest so couldn’t do the last 2 events at full power. Everything was in this competition: Action, drama, great performances and at the end a very happy winner, who won his second SCL ever in his career so far. Newcomer Mark Jeanes, Strongest man of Wales, had a great first day, standing 4th after 4 events, but lost is all in the second day. But he did fight until the end, so give him a hand. Martin Wildauer finished 5th overall. Very good results, seeing that he was still scared in the truck pull and took it easy in that event. He won the deadlift for reps together with Krzysztof and Jarno Kirsela from Finland – 6 reps for them with a 380 kg deadlift cars. Tomorrow, Thursday, 24 September, at 22.45 will be the first broadcast of the MHP Strongman Champions League Poland on Eurosport. Meantime, we will prepare for the coming World Championships Log Lifting in Lithuania on 4 October. Watch for more news to come soon. 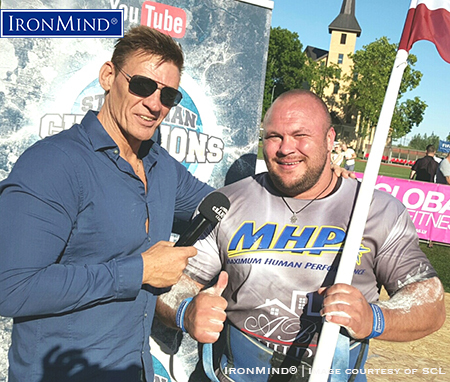 “With a top field and spectacular events last weekend in Poland, the strong Pole Grzegorz Szymański took his second win in the MHP Strongman Champions League in 2015,” SCL Director Marcel Mostert reported to IronMind. “After winning in Holland and beating Zydrunas there, in Poland he beat the runner up in the SCL rankings, Dainis Zageri, and the SCL Leader and his countryman, Krzyzsztof Radzikowski. “Although it must be said that Krzysztof came just back from the SCL Croatia, where he caught the flu, it cannot be denies that Grzegorz did a great job and won three out of six events. The last event, Power Stairs, was very impressive: Grzegorz crushed the field with 3 blocks of 220/250/280 kg in a spectacular time of 30.28 seconds and finished just before Stojan Tidorchev (35.75 sec) and Krzystof Radzikowski( 36.71), while the rest of the field finished in 40 seconds or more. “Krzysztof is still leading the MHP Strongman Champions League with 134 points after 8 stages, but we are just halfway. Dainis Zageris is second with 90 points and the mighty Icelander Haftor Julius Bjornsson is third with 87 points, so anything can still happen. “This coming weekend will be the 9th stage of the MHP Strongman Champions League and for the first time, SCL is coming to Austria, plus this will mark the comeback of Martin Wildauer. So, SCL Austria promises to be a great fight between the current SCL World Champion (Martin Wildauer) and the 2013 World Champion as well as current leader of the overall ranking (Krzysztof Radzikowski). Added to that, let’s not forget that in a field with 14 competitors, over 6 events, anything can happen so it will for sure be a battlefield again. May the strongest win,” said Mostert. 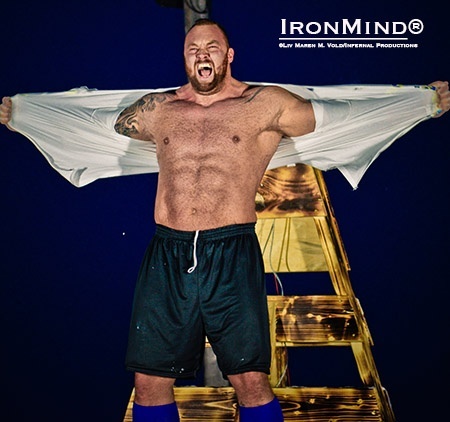 Hafthor Julius Bjornsson won Strongman Champions League–Croatia but Krzysztof Radzikowski held on to the Leader’s shirt—Aryn Lockart called the action for IronMind. In the beautiful city of Split, Croatia, the two day MHP Strongman Champions League competition is complete with Hafthor Bjornsson emerging as the champion. The competition was a close battle with a new world record in overhead dumbbell and close finishes throughout the day. In a city over 1700 years old, steeped in Roman tradition and history, the athletes arrived for day one for the truck pull after a picturesque boat ride on the Adriatic Sea. Before a packed crowd that lined the streets of Split, Hafthor completed the course pulling the 14 ton truck 25m, with an impressive 23.75 seconds. His time was over a second faster than the second place finisher Matjaž Belšak, who finished with 25.34 seconds. After the event was complete, the athletes travelled back in time to participate in the historical live museum event in the city center. The Diocletian Legion hosted an elaborate ceremony with the goal of preserving Croatian history and culture. Amid Roman soldiers and statesmen, the athletes transformed into imprisoned gladiators while the women became Roman goddesses. Day two of the competition took place at the harbor in the city center. Five events were scheduled for the day. Despite sweltering temperatures, the athletes were ready to battle. The first event was the car deadlift. Hafthor Bjornsson won yet another event finishing with 10 reps while Dainis Zagaris and Kzysztof Radzikowski finished in second with nine reps. Event two was the 100kg (220lbs) overhead dumbbell. With the sun glaring into the eyes of the competitors and the temperatures over 35 degrees celsius, Krzysztof Radzikowski managed an amazing world record completing nine reps to win the event. Matjaž Belšak finished second with 8 reps. The third event was the Yoke with approximately 400kg (880lbs) for 25m. With two women on each side, Stojan Todorchev from Bulgaria sprinted the course with an unbelievably fast 11.43 seconds. Radzikowski finished second with 12.60 seconds. Event four was the frame carry. With 360kg (792lbs) for 50m, once again Stojan Todorchev took off like a bullet finishing the event in 19.14 seconds. Hafthor finished more than two seconds behind with 22.17 seconds. Only three competitors finished the course in its entirety. The final event for the day was the Conan’s wheel. With 340kg (748lbs) pressing down on each athlete, Hafthor won his third event of the competition completing 810 degrees. Radzikowski finished second with 720 degrees. As the sun began to set, the winner was clear. Hafthor Bjornsson won with 2.5 points ahead of Krzysztof Radzikowski. Despite his win, it wasn’t enough points to take the leader shirt from Radzikowski. The battle continues with eight more competitions on the horizon and SCL Poland taking place next weekend. SCL Croatia was uniquely special with records broken, intense heat survived and an amazing opportunity to take a trip back in time while competing in one of the most beautiful places on earth. Adding his name to list of men who have claimed a SCL victory was Latvian strongman star Dainis Zageris. 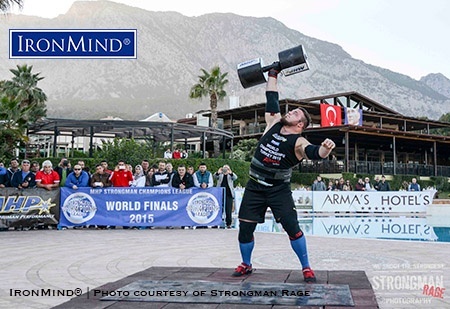 IronMind® | Image courtesy of SCLStrongman Champions League (SLC) Lativa saw Dainis Zageris capture his first SCL victory and Marcel Mostert called the action from the field for IronMind. Dainis Zageris Wins his First SCL Ever! On a beautiful 25-degree (C) day in a stadium filled with 5000 people, the Latvian hero Dainis Zageris won his first MHP Strongman Champions League ever and you can believe he was very happy about that as he beat Krzysztof Radzikowski, the SCL leader at the moment, as well as the complete field of 12 athletes. Although Krzysztof set a new world record in Latvia (Viking Press for 12 reps with 170 kg), but it didn’t help him take the overall victory. Also the other Latvian strongman did really well here, so it shows that the level is going up again in Latvia, where it all began with former strongman Raimunds Bergmanis—who is now a politician in the government in his country. The show went great and the public support was fantastic. Also, Ervin Katona made his first appearance as a referee in the MHP Strongman Champions League. “It was not easy. It’s a very different thing to be a referee, but all went very well,” Katona said. We look forward to the airing of this show and many thanks to Andris Bojars and his perfect oerganization. We will be back in Latvia next year. To watch the world record of Krzsysztof Radzikowski, click here. And tonight on Eurosport at 00.30 there will be the first broadcast of the SCL Holland 2015, featuring Zydrunas Savickas and Grzegorz Shymanski in a real exciting fight you won’t want to miss. 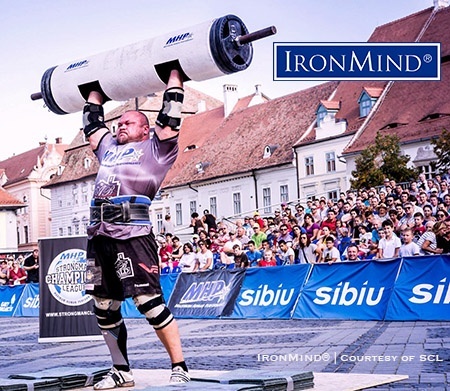 “With a temperature of 25 degrees (C) and a crowd of 5000 people, the stage was set and ready for a great strongman show in Bulgaria,” Marcel Mostert reported to IronMind. “The Mountain from Iceland [Hafthor Julius Bjornsson], the MHP/SCL leader Krszystof Radzikowski and the local hero Stojan Todorchev were a few of the ingredients that would make this a show to remember,” said Mostert. “Log lift, deadlift , farmer’s walk, yoke race, Conan wheel and the Atlas stones ending at 195 kg , were the other ingredients—classic strongman events that test the strength of these powerful athletes and are enjoyed by the fans. “It was a close battle between these 3 athletes and before the last event, the Atlas Stones, Hafthor Bjornsson and Krzsysztof Radzikowski were tied for the lead, Radzikowski felt a little pain in his right biceps and decided not to go for the maximum effort and he left the 195-kg stone sitting on the floor. “Hafthor was ready for showtime and slammed all 5 stones in 31.03 seconds for the leading time and enough to win the SCL title in Bulgaria. “It was a great show with a lot of fans who enjoyed the contest from start to finish. “Ervin Katona made his own history here as well. He did his last strongman show ever in his career. He stops after more than 250 competitions. Unfortunately he had torn his biceps during this last show with the yoke race. 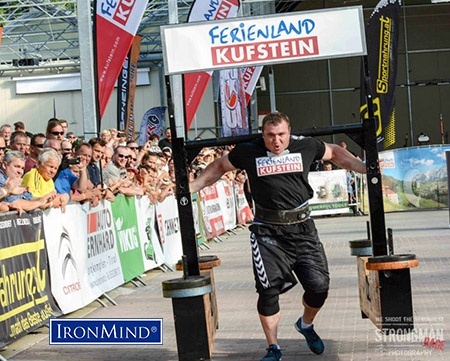 “However, Ervin Katona will not be out of the picture in Strongman world. He returns coming weekend already in the MHP Strongman Champions League Latvia as the new official referee in SCL. “We are all looking forward to his new job in Strongman and this represents another expansion the MHP Strongman Champions League team,” said Mostert. 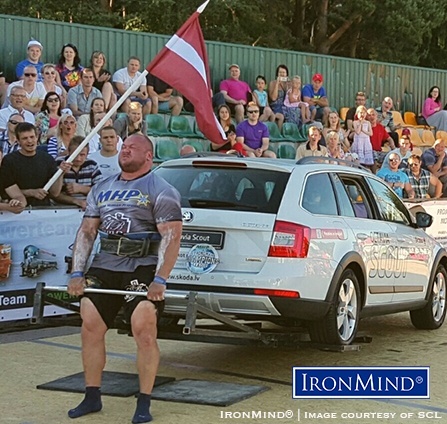 Facing a field of top professional strongman competitors that included Zydrunas Savickas and Hafthor Julius Björnsson proved to be no problem for Krzysztof Radzikowski in Merikarvia, Finland for what was the fourth stage of the MHP SCL series. The competition was a two-day event, with a total of six disciplines. The first day opened with the athletes doing a heavy Bus Pull, uphill, with a harness and rope. The best time was turned in by Hafthor Julius Björnsson, 32.89 seconds. Zydrunas Savickas was second, 34.35 seconds and Dainis Zageris came in third (42.96 seconds). Next was the Overhead Medley for time: 150-kg Log, 100-kg Giant Dumbbell, and 175-kg Log. The winner, of course, was Zydrunas Savickas with a very fast time 16.03 seconds. Second was Krzyzsztof Radzikowski (18.48 seconds) and third was Rauno Heinla (21.49 seconds). The last event of the first day was the House Carry: 452 kg with a distance of 25 m. The winner Krzysztof Radzikowski (14.43 seconds). Chris Gearing was second (16.56 seconds and Zydrunas Savickas was third (16.61 seconds). Zydrunas Savickas lead after the first day (with 33 points), followed by Krzysztof Radzikowski (31points) and Hafthor Julius Björnsson (27 points). Heavy rain with a cold, hard wind made the conditions very challenging. However, these are the strongest men, the real Vikings who don’t care about the weather—they are ready even in snow. Sack Loading was the first battle, with five sacks weighing 110 kg and a loading distance of 7 meters each. The best time belonged to Hafthor Julius Björnsson (29.86 seconds), with Rauno Heinla second (30.47 seconds) and Krzysztof Radzikowski thirs (31.75 seconds). Next up was the Front Hold with 25-kg cylinders and a back support. The winner Krzysztof Radzikowski (56.88 seconds). Alex Moonen was second (55.41 seconds) and Rauno Heinla was third (55.06 seconds). The last event in competition Frame Walk (330 kg) and Yoke (430 kg) Medley, with a total distance of 40 m. This was an extremely great battle between Krzysztof Radzikowski and Zydrunas Savickas, and Krzysztof beat Savickas by 3 hundredths of a second, with time of 26.47 seconds. Rauno Heinla was third (26.93 seconds). SCL Finland Organization thanks for all athletes, officials, event assistants, sponsors, the City of Merikarvia, SCL TV crew and all the others who made the competition happen. Next year, SCL Finland goes back to Vaasa. 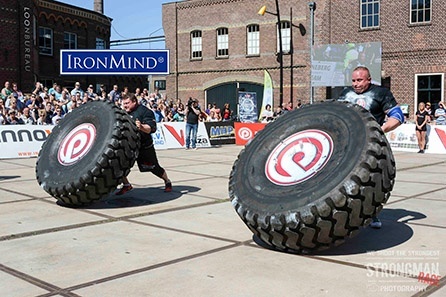 While the seven most powerful countries were gathering for the G7 conference in Germany, Holland was hosting 12 different countries with 14 of the strongest men in the world for the second stage of the MHP Strongman Champions League. After a night of heavy storms, the weather cleared with 25 degrees for the perfect battlefield in the quaint town of Ulft. Six events were center stage. Krzysztof Radzikowski was competing in his nationals in Poland, which meant J-F Caron was wearing the MHP leader shirt. Without any hesitation, the day started off big with the log lift for max. As each athlete worked their way up, Grzegorz Szymanski trailed behind Zydrunas Savickas with 190 kg. After the second lift, Savickas was in the lead with an easy 210-kg lift. The rumor was Big Z wanted to try for another world record. He had just successfully completed his last world record in Brazil only a week prior for 228 kg. With the log locked and loaded, Big Z took his position. As he pulled it to his chest, it just was not meant to be. The record would have to wait for another day. The event completed with Savickas winning the event at 210 kg, Szymanski at 190 kg and Ervin Katona and Dainis Zagaris tied for third with 185 kg. The second event was an 18 ton truck pull for 24meters. The course had a slight incline in the last 8-10 meters which left a lot of athletes giving maximum effort and leaving them completely worn out after the event. Despite his massive size, Savickas won this event with Szymanski in second and Alex Moonen taking third. Event three was the tire flip. Each athlete was required to flip the 420-kg tire seven times. Bjorn Solvang had perfect rhythm for this event and took an impressive third. Savickas and Szymanski battled head to head. Each flip occurred simultaneously. It was only in the last fraction of a second that Savickas’ tire fell to the ground first. The fourth event was the conan’s wheel with the weight of 330 kg. Athletes took their position and immediately the weight crushed upon them limiting their breathing as they made each rotation. Szymanski won this event with Dainis Zagaris taking second. “This was my favorite event,” Szymanski stated at the end of the day. Event five was the 430-kg yoke for 20 meters. Szymanski won this event ahead of Savickas and J-F Caron who took third. The final event of the day was the stones. Szymanski went into the event with a slight lead over Savickas. The balls weighing from 120-180 kg varied in weight and were loaded at different heights. The winner would be determined by the results of this event. Szymanski won the event solidifying his win for the day with Zagaris taking second and Caron third. Savickas ran out of tacky by the final ball and it slipped several times before he was able to complete the course. J-F Caron was thrilled to have the leader shirt and after the day with his fourth place finish, he acquired enough points to be the current SCL Leader. “I competed well, but I was disappointed in the stones at the end. I am too slow. I must go faster,” Caron stated. Szymanski took hist first SCL win in Holland. Last year he placed second. When I asked if he thought he could win, his response, “No. I didn’t expect to be able to win. I am very surprised.” He went on to thank the organizers stating that on every level the competition was great. Jarno Hams and Ervin Katona were also honored as they competed in their last SCL Holland. Hams was the top Holland athlete for the day and is preparing for his nationals where he hopes to take the 8th title as Holland’s strongest man. 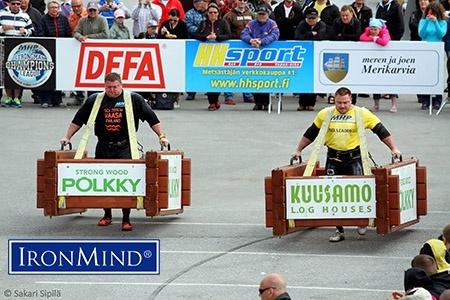 Next week the drama continues for the MHP Strongman Champions League in Finland. Undoubtedly this will be an intense battle for two days with Savickas, Thor Bjornsson, and Kzysztof Radzikowski returning to the field. The season is just warming up. 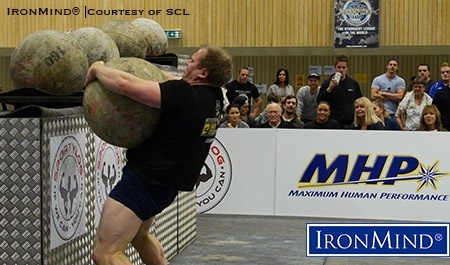 “We are proud to announce that we have signed an agreement with a new strongman organization in India,” SCL Director Marcel Mostert reported to IronMind. India has been so far not involved in strongman. Well, now they are,” said Mostert. “SCL and the new organization in strongman there, Strongman India (SI), are confident that within two years, national and international competitions will be organized. “CHALLENGE Barbell Present With the Association of S.Kumar Incorporation Creation a Sports team Strongman India. Strongman India will be sanctioned by Strongman Champions League (SCL) and will be the governing body for the sport of professional strongman in the India. ”Strongman India provides Indian athletes with opportunities by promoting numerous professional strongman event across the country throughout the year. These events include state, regional and national competitions. Strongman India also works directly with individual promoters, international representatives and Strongman Champions League worldwide to ensure that Indian athletes have opportunities abroad as well. “Strongman India has developed the first ever amateur-to-professional strongman sports program with Strongman Champions League (SCL) . This relationship allows young athletes the time to mature in the amateur ranks while having the opportunity to compete in strongman and Strongman India sanctioned events and earn their professional status. Strongman India also exhorts the growth of strongman game in the district level international level by SCL membership countries as they develop amateur-to-professional systems of their own. Strongman India will host the annual STRONGMAN CHALLENGE CLASSIC and recognized Players will join SCL World game. “The president and founder of this association is Sanjit Paul , who was engaged in Strength Sports business, powerlifting and weightlifting last few decades, is very happy with the new cooperation in Strongman and particularly with SCL. ‘Rajeev Charak Chairman of the Event Organize, is a former player of national weightlifting, National power lifting & bodybuilding, Former Vice president of North India body building & Fitness Association. “We welcome India for a great step into their strongman future. Soon we will do the MHP Strongman Champions League INDIA.”. 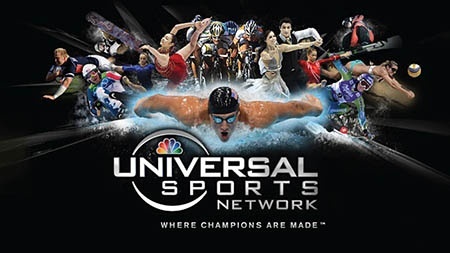 “Good news for strongman fans in the USA: strongman fan: The MHP Strongman Champions League signed up a deal with Universal Sports Network,” Marcel Mostert told IronMind today. “They broadcast in the USA and the Caribbean, so this means that all the fans can see the MHP Strongman Champions League series, in complete, full episodes. The first broadcasts will start on June 1 at 6 pm in the evening, which is a prime time slot. The complete 2014 series will be shown, every week, one episode.And after that, the 2015 series will be broadcast as well, around September or October and everybody can see as well the historic 1000-year old world record from Hafthor Bjornsson, the Game of Thrones star, done in the MHP /SCL Norway earlier this year. “We are very happy and delighted with this broadcasting deal and we think it will give another boost to our SCL series all around the globe. We have proven to be the best series in strongman with the greatest strongman competitors in the world. It is only champions who are competing in our league. Meantime we are to be seen now in 95 countries. “We wish everybody great pleasure to watch our series, recorded in 16 different countries all over the world in the best places you can imagine, so stay tuned and watch the first episode 2014, the MHP Strongman Champions League Martinique on the Universal Sports Network on June 1,” said Mostert. 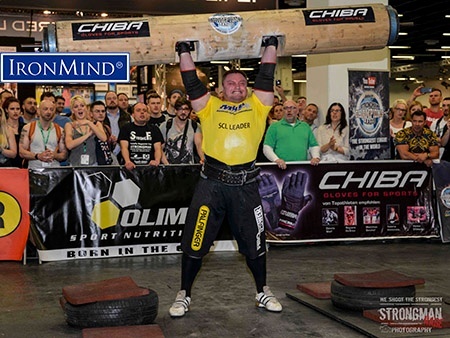 Before heading to the World’s Strongest Man contest, Krzysztof Radzikowsi broke the strongman world record on the giant log at SCL FIBO. Aryn Lockhart reported on the action for IronMind. The second stage of the MHP Strongman Champions League was held in Cologne, Germany at the FIBO, the largest fitness expo in the world. The competition was a fight to the finish with Krzysztof Radzikowski barely taking the win over Matjaž Belšak in the final event. In addition to the fight for first, the competition broke two records and tied another. Radzikowski broke Zydrunas Savickas’ Giant Log world record with 206kg, Belšak broke the FIBO Atlas stone record previously held by Travis Ortmayer and he also equaled the FIBO record for the circus dumbbell tying Vytautus Lalas’ record. With four of the 14 athletes headed to World Strongest Man in just a week, this was an impressive preview of what lies ahead. The competition hosted 14 of the strongest men in the world through six events. The day began with the Giant Log. What makes this world record unique is the log is not standard. This giant log is longer and has a wider diameter. A traditional log is 32cm in diameter whereas this one is 36cm, additionally this log is 3m long. Radzikowski dominated this event taking the world record and making 206kg look easy. Dainis Zagaris and Matjaž Belšak finished in second with 185kg. The next event was the Bavarian Stonelift. This is an event most international athletes have never seen before. The traditional strength event can be found throughout Bavaria (southern Germany) and Austria and consists of lifting a heavy stone a meter high. If athletes meet the one meter mark, more weight is added for the next round. Andreas Altmann who holds the world record in stone lifting won the event lifting 350kg for 87cm. Martin Wildauer, who holds the strongman stone lifting record was close behind with 75.3cm. The surprise from this event was Dainis Zagaris. Having never competed in stone lifting before, he impressively lifted 350kg 71.2 cm. The third event was the medley. Athletes carried a 400kg yoke for 20m and returned with a 110kg sack loading it onto a platform. Radzikowski again won this event with a fast 21.27 seconds. Alex Moonen took second with 24.56 seconds and Belšak took third with 25.07 seconds. Event four was the 87kg circus dumbbell for reps. Again a larger than normal dumbbell, Belšak won this event with an impressive 14 reps. He tied Vytautus Lalas’ FIBO record. Both J.F. Caron and Razikowski tied for second several reps behind with 10. Belšak continued his impressive streak winning the atlas stones and breaking the FIBO record previously held by Travis Ortmeyer. Belšak completed the 5 stones ranging in weight from 140kg-180kg in an amazing 19.89 seconds. The final event was the 350kg tire deadlift on the main stage. The win would be determined by this event. Radzikowski needed eight reps to win. In the final seconds, he struggled but completed his eighth rep taking the win by a single point. Radzikowski, Belšak and Caron all finished this event with 8 reps. The final top standings ended with 1. Krzystof Radzikowski 2. Matjaž Belšak 3. J.F. Caron. The top three winners from the FIBO are headed to world’s strongest man in the next week. Belšak stated, “I’m very happy with my first event this year.” This strong showing illustrates there are definitely some wildcards for World’s Strongest Man just around the corner. The top three winners from the FIBO are headed to World’s Strongest Man in the next week. 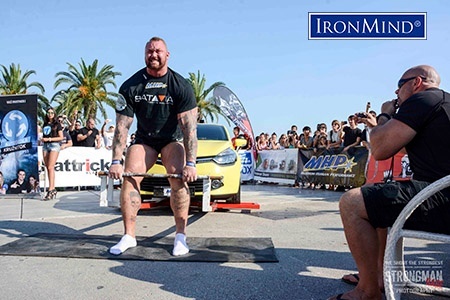 Belšak stated, “I’m very happy with my first event this year.” This strong showing illustrates there are definitely some wildcards for World’s Strongest Man just around the corner. 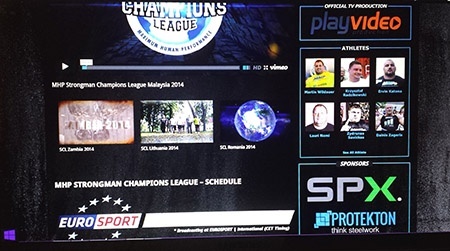 The 2015 MHP Strongman Champions League kicks off its Eurosport coverage on April 3 at 9:00 pm (21.00) CET. 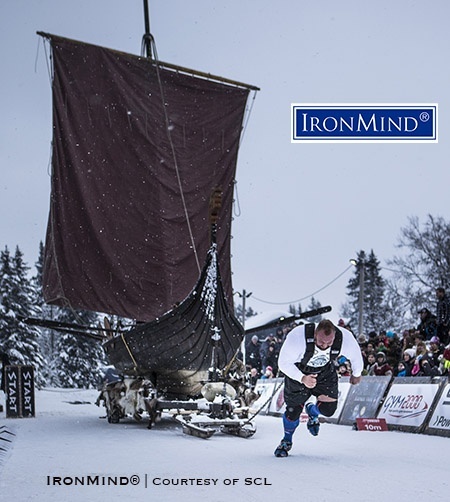 “This year we will start with the SCL Norway/The World’s Strongest Viking,” Marcel Mostert told IronMind. “You can see how ‘The Mountain’ Hafthor Julius Bjornsson performs in the ice cold mountains of the Viking land, Norway—where he also broke the 1000 year old Viking record carrying a 10-meter long log. The preparation and the complete competition will be shown. “Besides that, the MHP Strongman Champions League launched its new trailer today, featuring highlights of the complete 2014 SCL series. To see this great trailer, click here. “Meantime we prepare for the MHP Strongman Champions League–Germany, which will be done at the FIBO next week, 11 April, at the biggest fitness and strength expo in the world. The FIBO is already completely sold out for all the days! “Stay tuned here at IronMind for more breaking news about the FIBO next week,” said Mostert. The second stage of the MHP Strongman Champions League is set for 11 April, at the FIBO in Cologne, and the 2014 World champion Martin Wildauer, aka The Deadlift Kid, is expected to return to competition, Marcel Mostert told IronMind today. Wildauer suffered “a big injury in November of last year during the SCL Finals in Kuala Lumpur, Malaysia, where he ripped off his Achilles tendon completely. It’s remarkable to come back so fast after an injury like this,” said Mostert. The FIBO was won last year by Zydrunas Savickas. In a strong field with Eddie Hall, Krzysztof Radzikowski, Ervin Katona and more top strongman, the FIBO is always a prestigious contest to win for these athletes. So it will be this year again an awesome challenge with fireworks. “We are positioned for another strong year: the MHP Strongman Champions League is broadcasting our series now in 96 countries all over the world and we are confident that we will hit a 100 countries this year, a historically special target since we started the MHP Strongman Champions League in 2008. Besides of this big league, we will also gone do the World Strongest Team this year, an event which we invented already in 1996. More news about this later in the year. So, let it be a great strongman year for all favorites and underdogs, first with World’s Strongest Man in Malaysia, and after that the grand finale of our league in November in Malaysia as well. “The first world records we have set already again in Norway and China this year, and surely more explosives are to come this year and maybe already at the FIBO 2015 in Germany. We are truly looking forward to the new season 2015. “The record has been described in Icelandic Saga book,” said Kinnunen. “The legend of the Icelander Orm Storulfsson says that he walked three steps with this MONSTER WOODEN LOG which weighed over 650kg and was 10 m long! It took 50 mere mortals to help him placing it on his back! After he took his third step, his back broke under the enormous pressure and he was never the same after that! “Thor carried the 650kg and 10m log for 5 steps. The result was unbelievable and puts Hafthor Julius Bjornsson’s name in Viking history books,” said Kinnunen. “Well, today my friends, I made history!,” said Bjornsson. “As well as winning the title of The World’s Strongest Viking for the second time in a row, I carried this MONSTER LOG 5 steps! My back held up fine! “I’m on my way to my ultimate goal, to win The World’s Strongest Man! NOTHING CAN STOP ME!! NOTHING CAN BREAK ME! !,” said Bjornsson. The video is by Bernt Andreassen/Infernal Productions and here’s thelink. Those who have followed the world of strongman the last 20 years will almost instantly as the word competition is mentioned, picture palm trees and sun. Well … for the second year in a row, that picture is a very different one now. World Strongest Viking is probably the worst thing that ever happened to a strongman, next to the rash they get from their thighs rubbing against each other. Why? Here are three reasons: 20 degrees (C) below, snow and mountain. It will be also the first MHP Strongman Champions League contest ever held in Norway. – Loading natural stones up to 180 kg onto platform. And the coolest part of it all is that the average temperature for January is 20 degrees below (C), and the competition is being held outside. The athletes will do every single event outside, no matter how cold it is or how hard it is snowing. In Norway they say that there are no such thing as bad weather—there is only bad clothes. Well, the athletes better listen to this saying and bring their warmest clothes to the mountains. What would a competition called “World Strongest Viking” be without Vikings? Don’t be afraid; there will be Vikings. There will be Viking tents and Viking long boats. There will be handcrafted Viking pottery, jewelery, swords and clothes to buy, there will be Viking food and there might be mead. There will be a “Viking blot” (a Viking feast) in the evening and there will be Viking games. Last, but not least, there will be food. Plenty of amazing food. And, as noted, this contest will be the first MHP Strongman Champions Leaguestage out of again a series of 16 throughout this year which is broadcast in 92 countries all over the world. If you’re going to see just one strongman competition this year, this is the competition you can’t miss. MHP Strongman Champions League has launched its new website today and a key element is the 2015 calendar for what is the world’s largest professional strongman tour. Again we have 16 SCL stages, all over the world, and some extra competitions as well,” said Marcel Mostert, co-founder of SCL. “For the 8th year in a row, we present another 16 great competitions whereas the champions of their countries will be invited. “The best of the best will compete against each other for a whole year to crown the world champion 2015 in November. Broadcasting in 93 countries for sure and more to come. “But we also present other news: We have a new website, with new layout, also for mobile phones compatible, complete with Facebo, etc. “And our main sponsor, MHP, the world’s leading supplement company for all power sports at the moment, will continue as well for the third year now as the main title sponsor in the MHP Strongman Champions League. “Together with SPX – POWER TEAM hydraulic systems, Strongman Rage and Protekton as these sponsors will continue as well because their exposure was fantastic and absolutely phenomenal in 2014. We are very happy to have them on board, they are the pillars under our construction for sure.